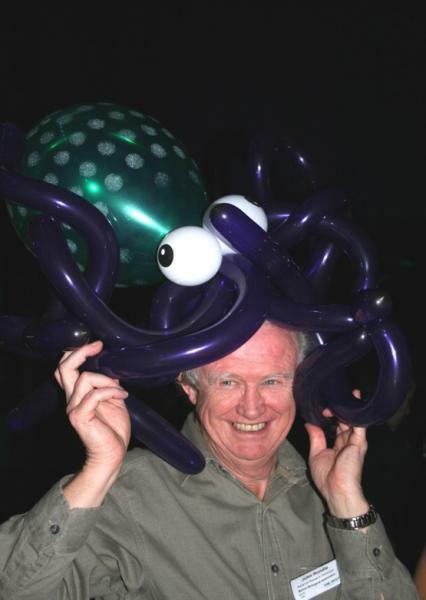 The Cephalobod in question is John Rundle (Top R, being attacked by a balloon model), now retired from the Marine Biological Association where he was for many years Head Aquarist, and expert on Cephalopodes, i.e. squid, octopus, nautilus and cuttlefish. Despite being retired and having time to come and talk to Coastwise, John still returns to the MBA to lecture. One of John’s main professional interests has been breeding marine animals (R, 3rd from Top, in MBA aquarium), and in retirement he has continued this interest with a conservation theme by focussing on African and Amazon Basin fish that are becoming scarce. 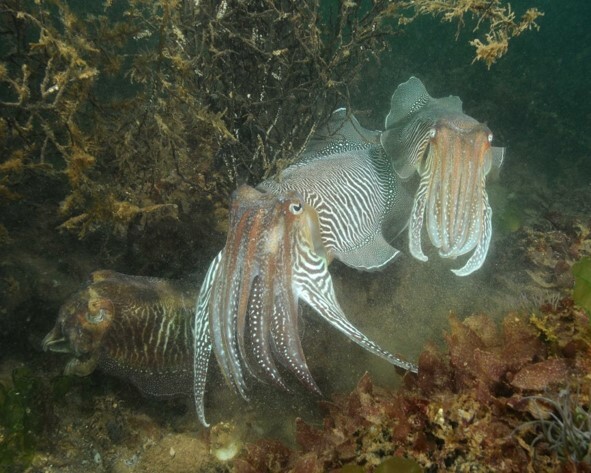 The main topic of his talk to Coastwise was the cuttlefish (R, 2nd from top, in Plymouth Sound, picture courtesy of Dr Keith Hiscock, Emeritus MBA Researcher and Lecturer), but he touched on giant squid, which have exercised people’s imaginations over the centuries. He gave some astonishing facts – eyes 8” in diameter, up to 60’ in length, three hearts, and blood that is blue due to the pigment haemocyanin. Cephalopods have the defence mechanism of squirting a dense dark ‘ink’. This is composed of almost pure melanin, and the animal can regenerate it in about 3 hours. As John told Coastwise members from first-hand experience, it is almost impossible to remove from clothes or skin ! 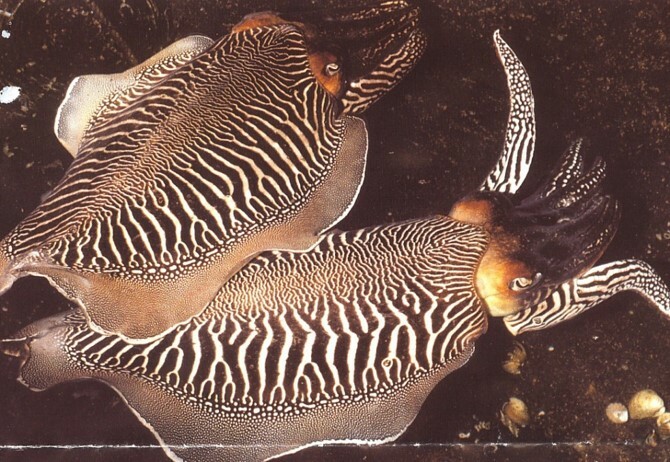 Cuttlefish, although much smaller, are also remarkable. They live about two years, so have to grow very fast, and are rapacious hunters and eaters. 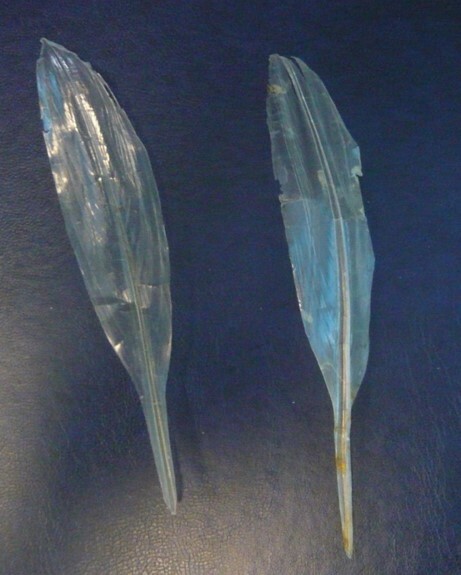 The familiar cuttlefish bone beloved of budgerigars is actually a complex calcareous structure with a gas sac (called a Quill, R, 4th from Top), and an important role in providing variable buoyancy. They have a hard beak to break open prey, and inject a neurotoxin through it into prey, which will kill, for example, a crab, in about 7 seconds. John concluded with an overview of the parameters required to support a successful breeding programme. In the wild, eggs are laid in vast numbers – up to 1000 per day - on sea grass, which is replicated in captivity by rope. Water quality, as regards salinity, pH, Ammonia, Nitrates and Nitrites, is crucial.